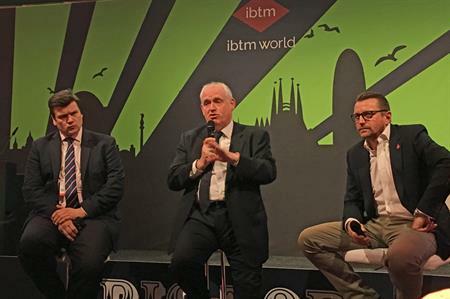 The impact of Brexit on the events industry will be minimal, according to a panel of experts speaking at ibtm world, which took place in Barcelona this week. The panel, featuring James Heappey, MP and chair of the All Party Parliamentary Group for Events, UK Parliament; Ian Cummings, vice president CWT Meetings & Events EMEA; and Ben Goedegebuure, Maritz global general manager EMEA, believe that the meetings industry is well positioned to survive any economic outcomes caused by Brexit. Goedegebuure said: "It [Brexit] has become a non-event in our industry. Everyone is waiting to see what will happen, but when it does, I think it will have a limited effect." Cummings agreed: "We work in a very resilient industry. We have come back from lots of difficult times, particularly the financial crash of 2008. There is an inherent desire for people to meet face-to-face and that will continue. Our outlook for 2017 is positive." Heappey admitted that there is uncertainty and anxiety among some UK event professionals around Brexit. "People are asking it we are headed for another downturn. But I don’t think it will be as bad as what happened nine years ago. The fact that the markets remain confident is a positive sign." He said that it’s in both the EU and Britain’s interests to make Brexit work, but added: "If we make a mess of Brexit and make it difficult for people to travel to the UK or to trade with suppliers, the events will still happen, they just won’t take place in the UK. "At the end of the day companies are going to still hold events, and we are just going to have to show that the UK is the best in the sector."